This weekend we are once again spoiled for choice with the quantity and variety of festivals and fireworks being held in various locations in Saitama. Here is a small sample of the festivals and fireworks on offer on SATURDAY the 6th of August. We have everything from super size fireworks to smaller local affairs. From mammoth crowd-drawing festivals to traditional lower key ritual celebrations. Wherever you go, do plan for crowds, heat and fun galore! Todabashi fireworks are one of the biggest in Saitama. Approximately 12,000 fireworks are launched including starmines and shakudama. The displays are set to music. They normally have fireworks that explode into the face of a famous character. Last year, it was some Yokai Watch characters. The fireworks are launched near Toda’s race course with prime viewing along the riverside. You can walk from Toda Park station. 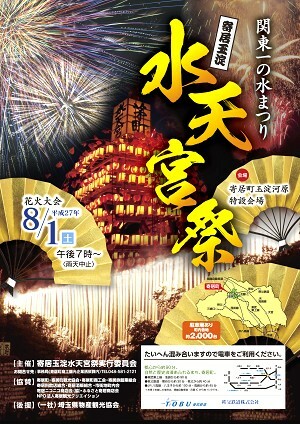 The Itabashi Fireworks are held in conjunction with Todabashi. They estimate 52,000 spectators view on the Itabashi side and 42,000 on the Toda side. You can reserve a viewing spot at a price on the official website (below). Queries to Todabashi Firework Committee at 048-431-0206 Time: 7 to 8.30 pm Access: Approximately a 20 minute walk from Takasaki Line JR Toda Koen station URL: www.todabashi-hanabi.jp. This event will not be carried out in the event of rain. There will be 4 firework displays in total in the Tobu Zoo over the month of August. 2000 fireworks, including starmines and the niagra type, are launched There is usually about 10 festival stalls. Time: from 7.30pm Access: About a 10 minute walk from Tobu Skytree Line Tobu Doubutsu Kouen Station URL: http://www.tobuzoo.com/event/details/1118/ Apart from the fireworks and festivals on Saturday the 7th, there are also a number of special events on in Saitama. One of our picks is the night zoo at Saitama Children’s Zoo which is only open for 6 nights in August. You can see the dates and more events on the insaitama calendar.